Yield: Serves 4 to 6 as a side. With so much emphasis on tagine and couscous in Moroccan cuisine, it may come as a surprise that rice earns a place at many Moroccan tables, showing up in salads, paellas, stuffings, and desserts. While plain rice is steamed in many homes, this delicious Moroccan side is given typical pilaf treatment by simmering the rice in broth with veggies, saffron and other Moroccan spices. It can stand alone as a satisfying side or vegetarian entree, but my usual preference is to serve it as a bed for savory Moroccan Saffron Chicken. Try the vegetables I've suggested for color and flavor, or vary the dish by using a cup or more of any diced vegetables of your choice. The tips below offers variations in how to handle the veggies. * You can substitute other vegetables of your choice, up to 1 cup. In a sauce pan, heat the stock almost to boiling and hold warm. Heat the saffron threads carefully for a minute in a small skillet, just until dry enough to crumble. Crush them and add to the stock. While the stock is heating, combine the remaining ingredients in a deep skillet or 4-quart pot. Cook the rice and vegetables over medium heat, stirring frequently, for about 10 minutes, or until the onions are translucent and the rice begins to color. Add the stock and saffron to the rice, stirring only once. Bring the stock to a simmer and taste for salt. Adjust the seasoning as desired. Cover the rice, reduce the heat to low, and simmer gently and undisturbed, for about 25 minutes, or until the liquid is absorbed and the rice is tender. If you prefer to have a crisp-tender texture to your vegetables, saute them on the side while the rice is cooking; stir them gently into the rice just prior to serving. If you have picky eaters, coarsely chopping the vegetables will make it easier for them to pushed to the side. Or, chop them very finely to help disguise them. 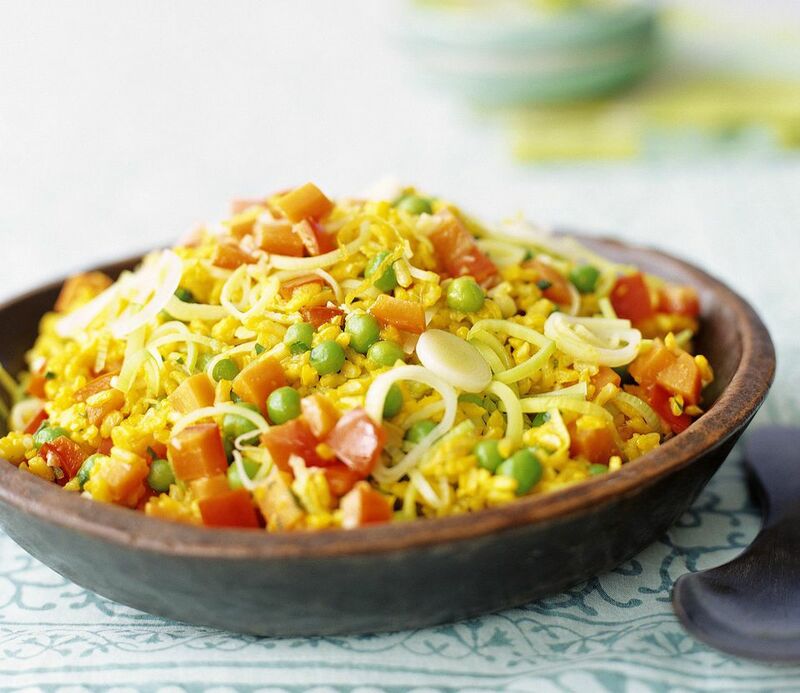 For true veggie lovers, increase the quantity of vegetables and leave them extra chunky so that their full flavor can be enjoyed along with the rice. Some Moroccans like to wash and/or soak rice for a half hour or so to remove starches. I don't bother with more than a quick rinse, but if you do soak your rice, be sure to use slightly less cooking liquid and reduce cooking time to avoid mushy texture.